Each student is cast in one show for the summer. We choose plays which work best for an acting ensemble rather than scripts which feature only one or two leading roles. 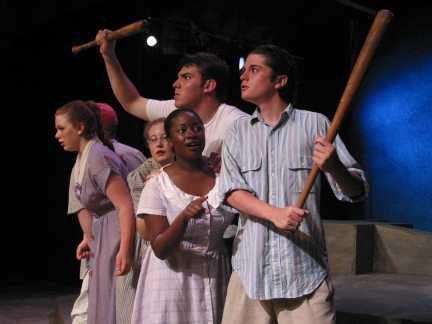 Some past productions have included The Fantasticks, Our Town, Antigone, As You Like It, The Crucible, To Kill a Mockingbird, Hay Fever, Great Expectations, Under Milkwood, The Dining Room, The Caucasian Chalk Circle, Peter Pan, Pericles, Blood Wedding . Often scripts are created by a playwright to meet ETC's specific requirements.